These pulled pork nachos are loaded with flavor and they have a little secret. Are you ready?! They are completely vegetarian! Yes, you read that right. They are loaded with pulled pork flavor and will make both the meat eaters and the vegetarians in your group happy! Check out this great ibotta deal when you buy 3 MorningStar Farms® products! We are going into one of our favorite times of year to entertain. With Labor Day right around the corner, we always host a get together for our family and friends. Then football season begins immediately after that. We just had our fantasy draft and the pick'em pool invites have already gone out. With all of this competition each week, we like to get together. It is a lot more fun to talk smack face to face! Our house tends to be the place where people gather. Whether it is an impromptu BBQ or watching the game, our gatherings always include plenty of food. We love all of the standard fare, burgers, pulled pork, nachos, chili and more. However with each passing year there seems to be more of us either watching our figures or trying to eat healthier. We aren't quite as young and carefree as we used to be! So I was really excited to find MorningStar Farms® Pulled Pork in the freezer section at Wal-Mart. It is brand new and I couldn't wait to try it. Those of you who come here often know we have a special place in our heart for pulled pork, so it definitely had some big shoes to fill. I was curious and my husband was dubious. I went to work making a loaded sheet pan of nachos. The pulled pork actually looked like pulled pork. I warmed it up and stirred in some BBQ sauce. With some black beans and corn I knew the BBQ pulled pork would be filling, hearty and delicious. You know what? It was delicious! The pulled pork had a really nice meaty chew and even my husband liked it! He said he wold happily eat more of these nachos during football season. Our Sundays just got a bit healthier! While we loved the nachos, with Labor Day weekend coming up we wanted to make sure our vegetarian friends were covered at our BBQs as well. So I picked up a pack of MorningStar Farms® Spicy Black Bean Burgers as well. They don't call them America's #1 veggie burger for nothing! 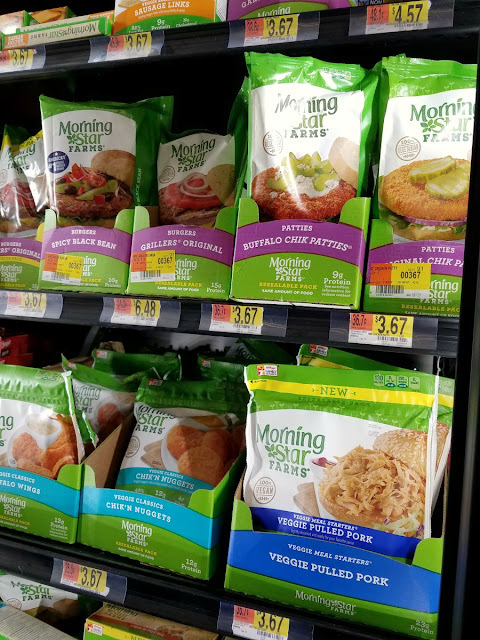 I had to pick up some MorningStar Farms® Buffalo Chik Patties® as soon as I spotted them. We have always love serving variations on buffalo chicken during football season. Sometimes we go with a classic buffalo chicken dip or we mix it up with buffalo chicken taquitos. Either way, our vegetarian friends are left out. 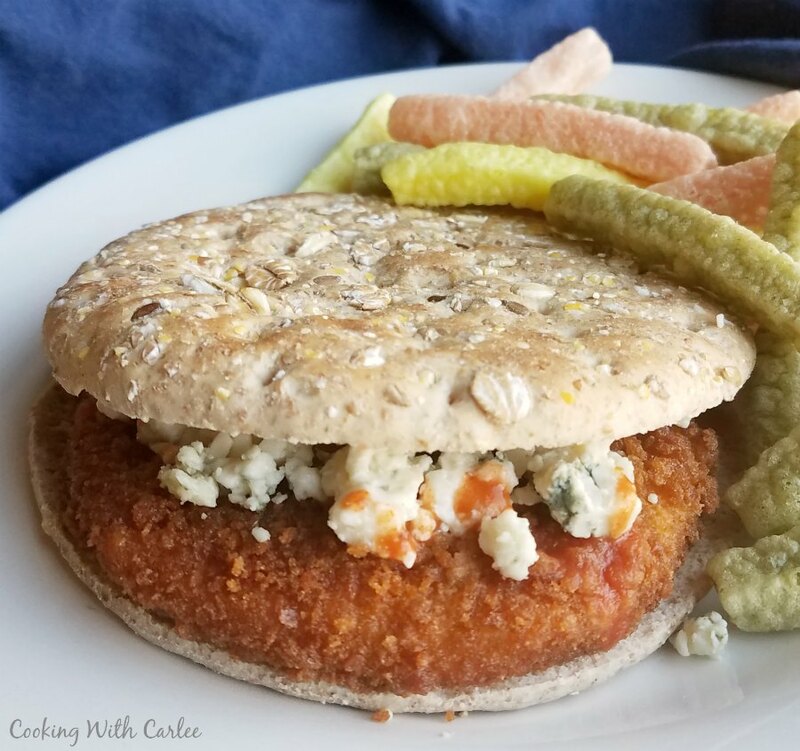 I can't wait to make some buffalo chik sandwiches this year that everyone can enjoy. Whether you are vegetarian or trying to go meatless on Mondays. Maybe you are trying to cut back in your meat intake or looking for options that will satisfy both your vegetarian and carnivorous friends. No matter what the reason, there are plenty of great options to choose from. So next time you send out the invites for a backyard BBQ or a football watching extravaganza, be sure to stock the freezer first. Armed with some great MorningStar Farms® products you will be able to satisfy everyone in attendance! These pulled pork nachos are loaded with flavor and they have a little secret. Are you ready?! They are completely vegetarian! Yes, you read that right. Preheat your oven to 425 F and spray a sheet pan. Cook the pulled pork according to the package directions. Stir in the BBQ sauce. Spread chips over greased sheet pan. Top with pulled pork, beans and corn. Sprinkle with cheese and bake for 5-10 minutes or until cheese is melted to your liking. I would say that there is zero percent chance that I would like this- that was before I tried that burger. I took half thinking I should try it. Had to go back and get the other half. Now I'm pretty certain that I would enjoy the pulled pork too. I'm glad you have an open mind about it now! It was really delicious! Too funny, my friend and I just had pulled pork nachos for lunch yesterday! Love the MS Vegetarian idea! Yours look so pretty! Thanks, Andrea! Aren't pulled pork nachos the best? Oh yum! 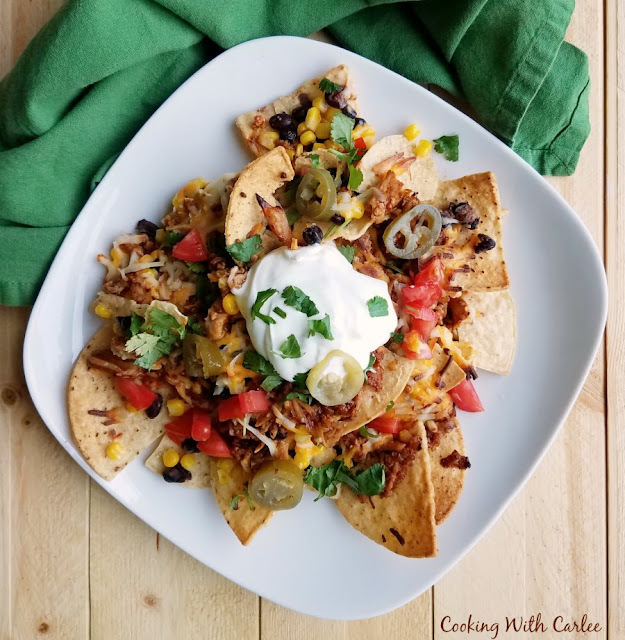 These nachos are right up my alley and so super easy to make! Score! They are so easy and full of flavor! I just love nachos, don't you?! You definitely need to give it a try! We really enjoyed the nachos and hope you do too! We really enjoyed them! Such a great way to keep both the vegetarians and meat eaters happy with one dish! I can't WAIT for football season! And for vegetarian pulled pork nachos :). They sound nothing short of amazing. Hope you're having a great week, Carlee! It definitely looks like pork and it looks delicious! Doesn't it look like the real deal? Thanks! I love Nachos and these pulled pork nachos sound delish! That is nice of you to cover your vegetarian friends too. Have a great day. It's a great way to make everyone happy without having to make multiple dishes! Now those nachos look like a little bit of heaven and I can't resist nachos! You always have such amazing recipes, keep up the good work. I am a sucker for nachos too. I don't make them often because I don't have an off switch once I get started! But it's so worth it every once in a while! Thanks, Amy! Hehe! You just never know what I'll be up to next! Both you and your friend are sure to love the MorningStar selection. We really enjoyed all of the things we tried! I love nachos and I love pulled pork yet I have not done pulled pork Nachos! Thanks for spurring me on. You definitely need to do it! 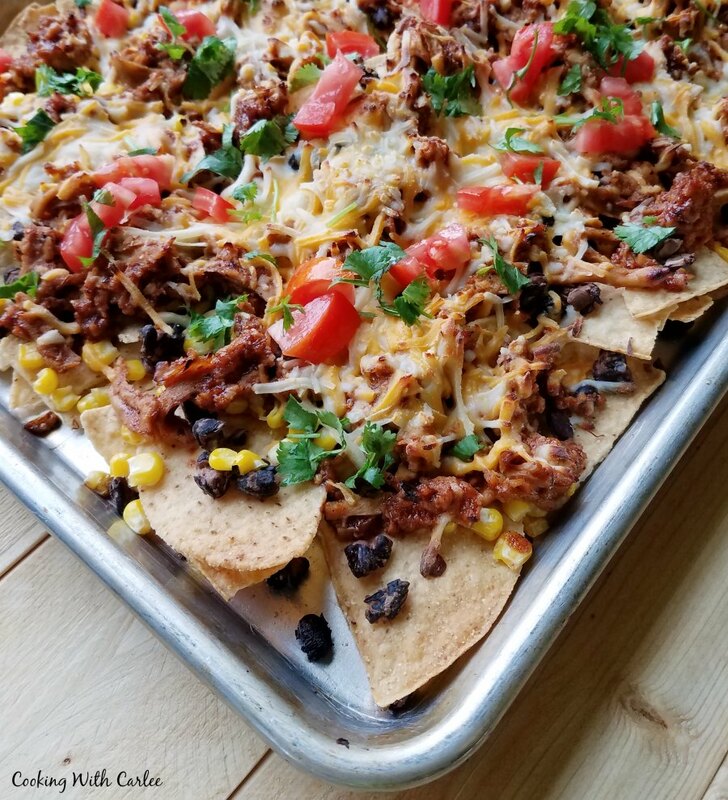 Pulled pork is the perfect nacho topper! We like to do ours with BBQ flare, but it would be great with traditional nacho toppings as well! I have to share this with my mom. My sister and her family are vegetarian, so mom is always looking for new recipes to try when they visit. Especially ones that "everyone" can enjoy! I know she'll try this! I was nervous my husband wouldn't go for it as he is so particular. I offered him a bite of the buffalo chik sandwich, then I took a bite to try it. Next thing I knew, the whole thing was gone. Luckily I got more than one bite of the next one! He also really enjoyed the nachos. These Nachos are just amazing! Thanks so much for sharing with us at Full Plate Thursday. Have a great weekend and come back to see us real soon! These loaded nachos look delicious! What a great menu option for BBQs and tailgating parties. Thanks for sharing! Thank you so much, Jesenia! YOu know the way to my heart, don't you??? Nachos and pulled pork.. Did I spot black beans on there?... I'm on my way over! 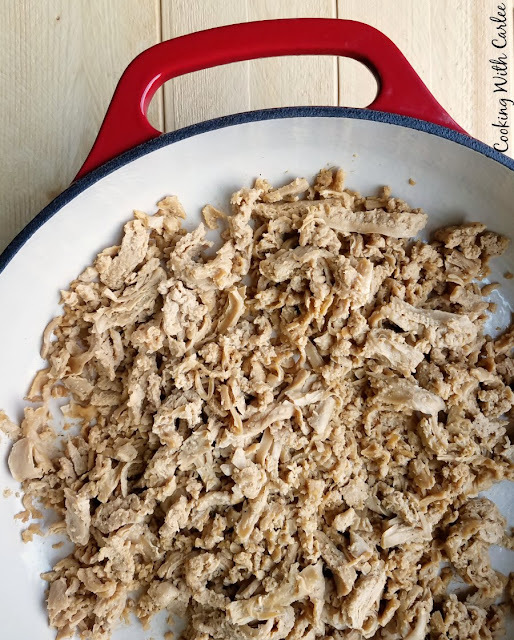 thanks for sharing at Celebrate 365 Football Party recipe Round up!